To get here: Hwy 82 to Hwy 133. Go south towards Redstone. Turn left at the stoplight by the Fire Station (Meadowood Drive). Follow to the end of the road. Skate Park is on your right. Below is a picture of our very own skateboard lesson instructor, Chris Johnson, testing out the Beginner Section (completed fall 2011). At 17,300 sq ft, the Carbondale SK8 Park, located at North Face Park, boasts flowing trannys with street course around the decks. The bowl is one big snake run with all kinds of different depths and 26 hips. This park features steel coping throughout. The park offers Colorado’s first 18 foot fullpipe with a capsule end! Designed and built by Grindline Skateparks Inc., the skate park is located off Hwy 133 on Meadowood Drive, behind the fire station. 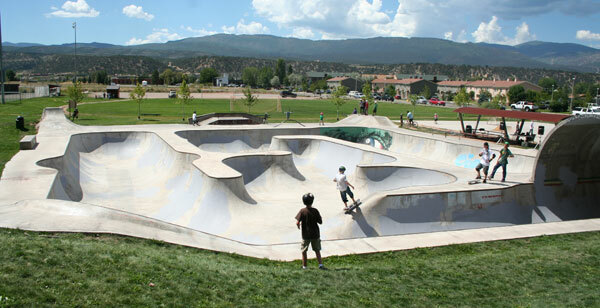 A Great Outdoors Colorado (GOCO) grant was received to construct a new beginner section at the North Face Skateboard Park in 2011. The 4,000 sq. ft. skatepark addition was designed with a beginner bowl and streetscape features geared towards the younger beginner skateboarder. The new skatepark addition allows beginner skateboarders to learn and obtain the skills needed to skate the adjacent intermediate and advanced park where the steep and deep bowls and transitions have been too difficult and intimidating for them. Construction of the beginner addition was completed by Evergreen Skateparks, with generous contributions from Casey Concrete. Check out Evergreen’s website for additional photos of their work: http://evergreenskateparks.com/. These facilities have been designed for use by skateboards, rollerblades, scooters, and bicycles. ***HELMETS AND ALL OTHER SAFETY EQUIPMENT ARE HIGHLY RECOMMENDED AT ALL TIMES*** In order to provide a safe and enjoyable experience, the following warning and rules have been posted. Please heed the warning and observe all rules. WARNING: Use of skateboards, rollerblades, scooters, and bicycles are hazardous recreational activities. Use of these facilities may result in serious injury or death. The Town of Carbondale does not assume any responsibility for injuries or death. Each person entering these facilities assumes all risks associated with the use of these facilities.